The Daily Dimwit: 1st Ever Dimwit Football Group Break - Sign Ups ARE FULL!!! 1st Ever Dimwit Football Group Break - Sign Ups ARE FULL!!! 2011 Crown Royale, this product guarantees 4 hits and is focused more on the hit aspect of the product. All kinds of great rookies from last year's draft class. 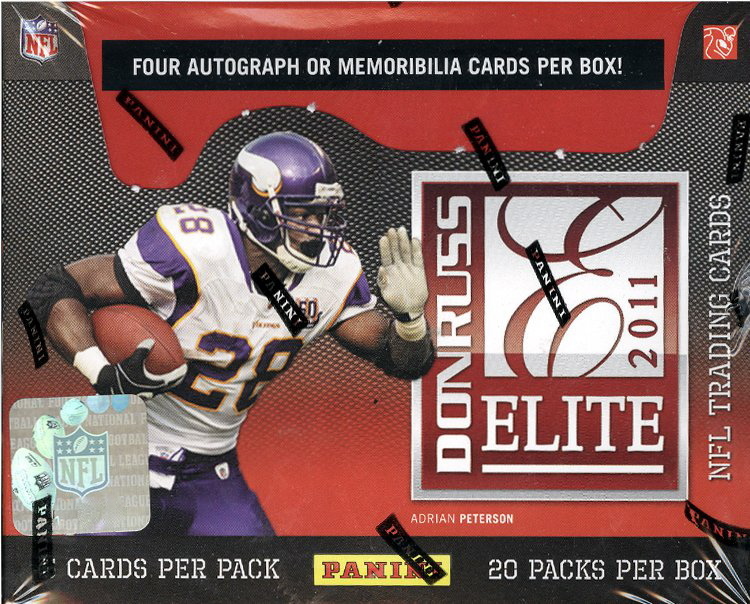 2011 Donruss Elite - 20 packs, 4 hits... this one is more about the base and inserts to me. 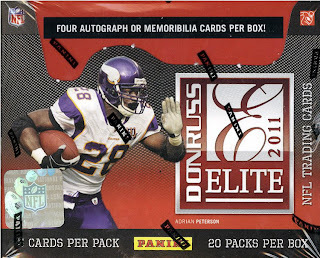 Again, great hits from past and present in this box. I wanted to get two products that would draw interest and also provide a good number of cards per slot potentially. 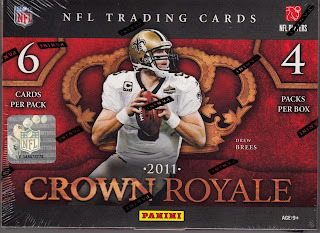 This break will end up with 8 hits and a bunch of other cards. If any slot gets skunked, I'll make sure they get some cards anyway. Ok, so this will work like my baseball breaks. $10 will get you a 2-team slot, one randomized and one your pick. Pick your team by leaving a comment ON THIS POST. Once 16 slots are full, I'll randomize the rest! If you want more than one slot, every slot after the first is $9 per slot. International will be $13 for the first slot, $9 for each slot after that. Any cards with multiple teams will be settled via randomization. Any multi-team hits involving one of my teams (picked or random) will be settled via randomization as well. Any team that has moved will go to the current franchise (exception: Browns, all Browns cards will go to the current Browns franchise). I will go in for my 49ers. Figures my team (Carolina) would be claimed before I see this. D'oh! I will take the Bengals. I'll take the Colts as a second team! Will send payment when it's full. I'll take Buffalo as a second team. Will send $9 payment when full. Let's make this happen...I'll take Arizona, Denver, and Baltimore. Do you want me to make payment now or wait until full?